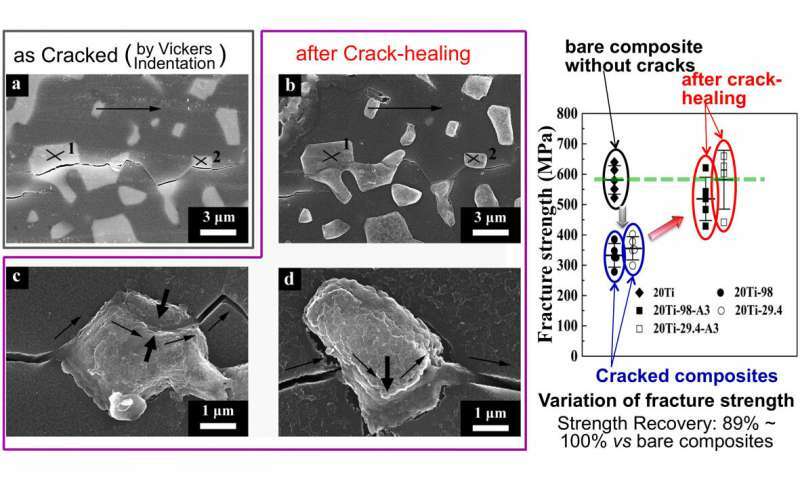 A team of researchers at Osaka University demonstrated that cracks induced in composites consisting of alumina ( Al2O3) ceramics and titanium (Ti) as dispersed phase could be healed at room temperature, a world first. This ceramic healing method permits crack-healing even in a state in which ceramic parts are mounted on devices at a low cost and without using complicated high-temperature heat treatment processes that require significant amounts of energy. Although various types of metal-ceramic composites have been researched and developed, their combination and fine structures were limited because of differences in ceramic-to-metal bonding types, chemical reactivity, and the particle size of commercially available metal powder. In this study, the researchers demonstrated that electrochemical anodization occurred in Al2O3/Ti composites. In addition, they developed a room-temperature healing method to heal cracks induced in Al2O3/Ti composites by using the anodization phenomenon without heat treatment, recovering the strength of the composites to their original level, a world first. The results of this research were published in the Journal of the American Ceramic Society. To heal ceramics, crack-healing by chemical reaction (self-healing ability) has been studied, but a high-temperature treatment of 1,000℃ or higher was necessary to cause a chemical reaction and/or a diffusion reaction, so called re-sintering. Moreover, because crack-repairing methods using resin adhesive (e.g. epoxy resin) or ceramic cement had a limit in adhesion between ceramics and resin or ceramic cement, it was difficult to fully recover the fracture strength to its original level. In this study, the researchers achieved high electrical conductivity by homogeneously dispersing Ti, demonstrating room-temperature crack-healing in Al2O3/Ti composites by anodization without heat treatment and full recovery of fracture strength to its original level for the first time in the world. The recovery was due to an titanium oxides formed on the surface of dispersed titanium by anodic oxidation, which bridged cracked-surfaces and filled the crack, reducing stress concentration on the crack tip. Senior author Tohru Sekino says, "The results of our study can also be applied to ceramic-based composite systems other than Al2O3/Ti composites as a new crack-healing method for ceramics, and a technique for ensuring the reliability of the ceramics themselves. Al2O3/Ti composites will be developed into multitasking materials that allow for multiple functions and applications according to their purpose and use."